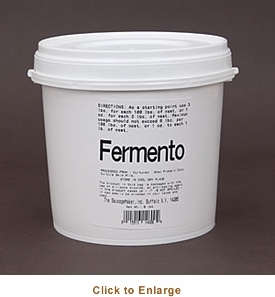 You�re viewing our Sausage Maker Fermento starter culture for sausage making. TSM's Fermento is a starter culture that immediately creates a tangy flavor when mixed with ground meat used for semi-dry cured sausage. This speeds up the sausage making process, you can stuff and smoke sausages immediately. 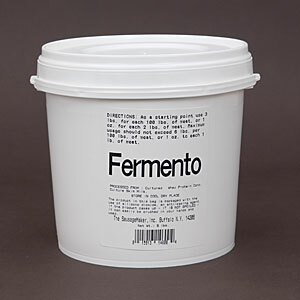 Fermento is typically used in cervelat, venison summer sausage, goetburg, and other summer sausages. Fermento contains cultured whey protein and skim milk. Use 1 oz. of Fermento per 2 lbs. of meat, do not exceed 6 lbs. with Fermento of total 100 lbs. of meat. Package contains 5 lbs. Fermento starter culture, the 5 lb. package will process approximately 160 lbs. of meat. If you have questions about our products we are here to help you. Scroll down to view our Sausage Maker Fermento starter culture for sausage making.